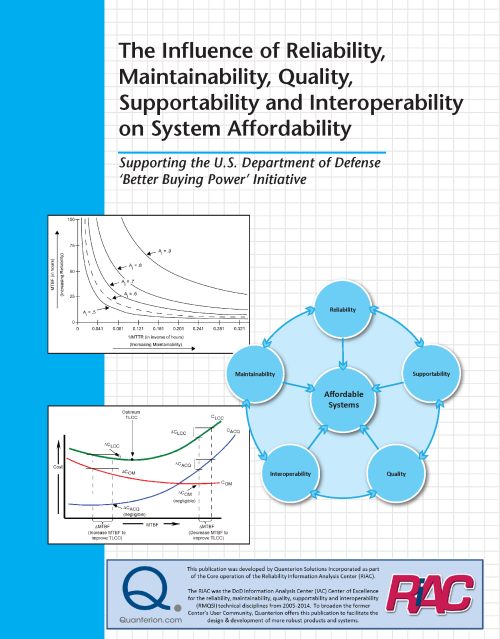 This publication, reflecting the specific mission of the Reliability Information Analysis Center (RIAC), discusses how the effective application of Reliability, Maintainability, Quality, Supportability and Interoperability (RMQSI) tools and processes will ensure that essential warfighting capabilities are delivered that meet system suitability requirements at the most affordable cost. The publication describes how each of the RMQSI disciplines impacts the overall affordability of a system during the evolving phases of its life cycle. Realigning and refocusing Information Analysis Center (IAC) capabilities and products on defense system affordability, in conjunction with current DoD Better Buying Power initiatives, is an essential task for DoD and the Defense Technical Information Center (DTIC) leadership going forward. This publication, reflecting the specific mission of the Reliability Information Analysis Center (RIAC), discusses how the effective application of Reliability, Maintainability, Quality, Supportability and Interoperability (RMQSI) tools and processes will ensure that essential warfighting capabilities are delivered that meet system suitability requirements at the most affordable cost. The publication describes how each of the RMQSI disciplines impacts the overall affordability of a system during the evolving phases of its life cycle. To be most effective, RMQSI processes and analyses must be initiated very early in the acquisition process, Pre-Milestone A, and continue throughout the system life cycle in order to create the greatest Return on Investment (ROI) and an optimal Ownership Cost (OC) and Total Life Cycle Cost (TLCC). The relationship of RMQSI costs to the Sustainment and Availability Key Performance Parameters (KPPs), the Reliability and Ownership Cost Key System Attributes (KSAs) and the RAM-C Manual processes are discussed. The publication comes with a MS Excel-based tool titled “Optimized Reliability Requirements and Cost Analysis” (OR2CA), developed by Quanterion Solutions Incorporated, that automates the RAM-C process and incorporates three innovative ideas from the Authors presented in the publication: (1) how to define better specified inherent system design reliability requirements from stated warfighter operational reliability needs, (2) cost optimization to support investment decisions regarding reliability growth activities during design/development and test, and (3) a more effective Work Breakdown Structure (WBS) to capture actual reliability costs as a function of measured reliability improvement to provide more accurate ROI analysis and interpretation.